There’s no right age to travel, but your twenties really are the perfect time to get out and see the world, while you’re young and don’t yet have loads of responsibilities! 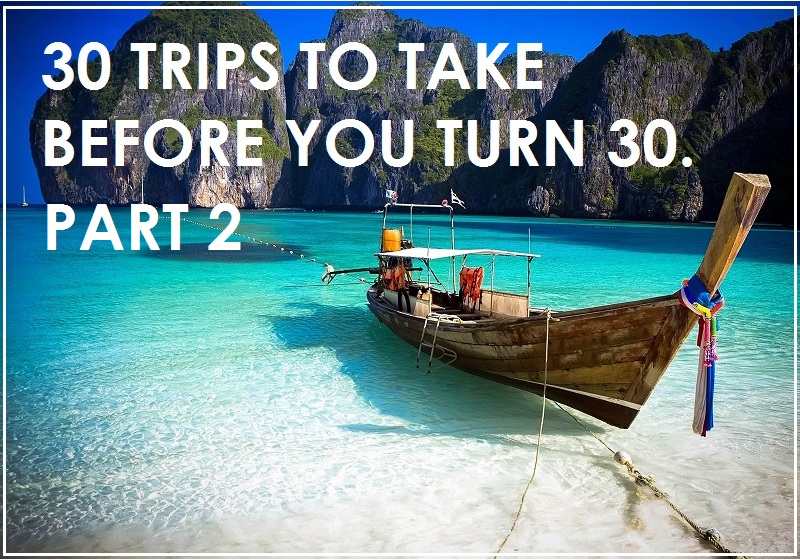 So here in no particular order, is our ultimate list of thirty trips and travel experiences to take before you turn 30! South East Asia is without doubt one of the best places to visit in your twenties. Backpackers from all over the world flock to South East Asia because it is cheap, full of culture, there is ridiculous parties, picture perfect beaches, adventure sports and travellers from all around the world to make friends with. Most opt for the Thailand, Laos, Vietnam, Cambodia loop – but there’s also the beauty of Burma and beaches of Indonesia too! Everybody loves a road trip and the US is one of the best places in the world to do so. Each state is so unique and their roads are fantastic. Whether you choose to cruise the west coast, east coast, the legendary route 66 or drive straight across the southern states as I did last year from Miami to Vegas, it’s guaranteed you’ll have a good time cruising the open roads. The Sahara Desert is the worlds largest hot desert and covers 11 countries, most people visit it from Egypt, Morocco or Tunisia as some of the other countries unfortunately aren’t the safest for tourists. Some of the sand dunes can reach a crazy height of over 180 metres in height! 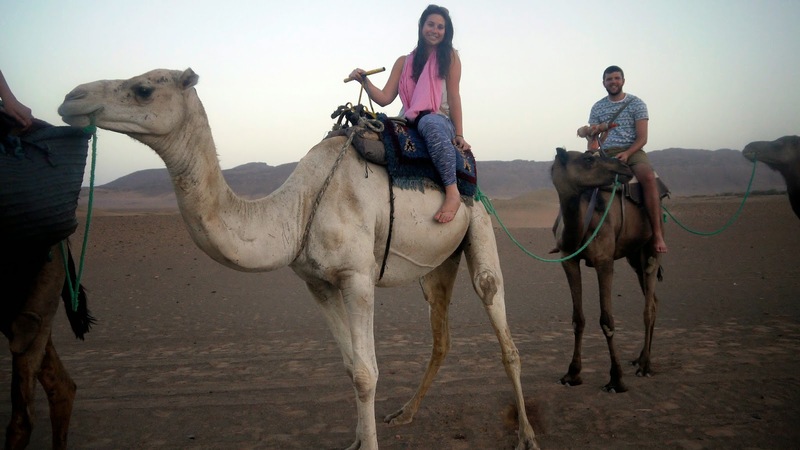 A Camel Safari & sleeping in a camp site among the dunes is an experience of a lifetime. Europe is quintessential trip for young travellers! Who doesn’t want to see the Colosseum, climb the Eiffel Tower, marvel at the ruins of Pompeii, ride a double decker bus in London, swim in the Mediterranean, soak in the culture, eat incredible new foods, experience crazy festivals and be able to jump on a train and be in a new country within hours! Whether you want culture, adventure, partying, museums, beaches, mountains, snow or sunshine – the Euro trip is what every twenty-something dreams of! The Amazon is accessible from many countries in South America. Do yourself a favour and visit the Amazon whilst in South America – hike through the rainforest, go piranha finishing, swim with pink dolphins, go searching of anacondas and alligators and hunting for tarantulas and discover the culture and way of life of those who depend on the Amazon for every aspect of their lives. 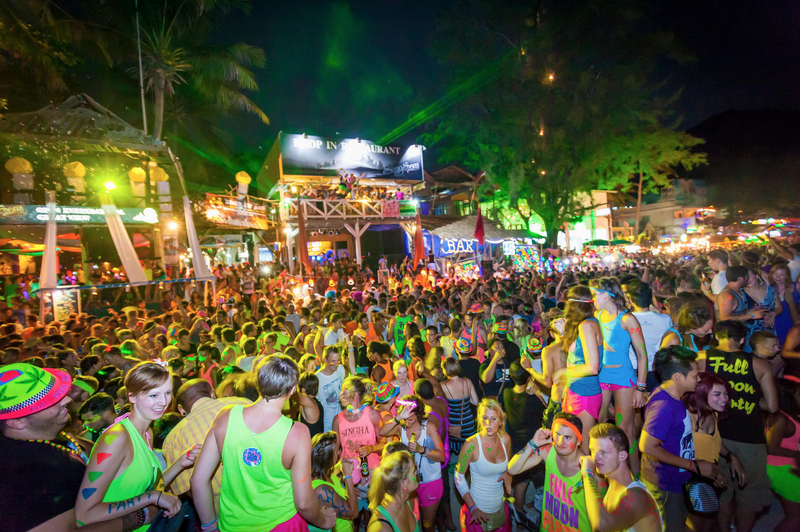 Thailand’s Ko Pha Ngan and it’s full moon parties are renown all over the world. Slather yourself in fluorescent paint and spend the night drinking from buckets, jumping through the fire skipping ropes and even braving the fire slide whilst partying on the beach until the sun rises with hundreds of thousands of other party animals! 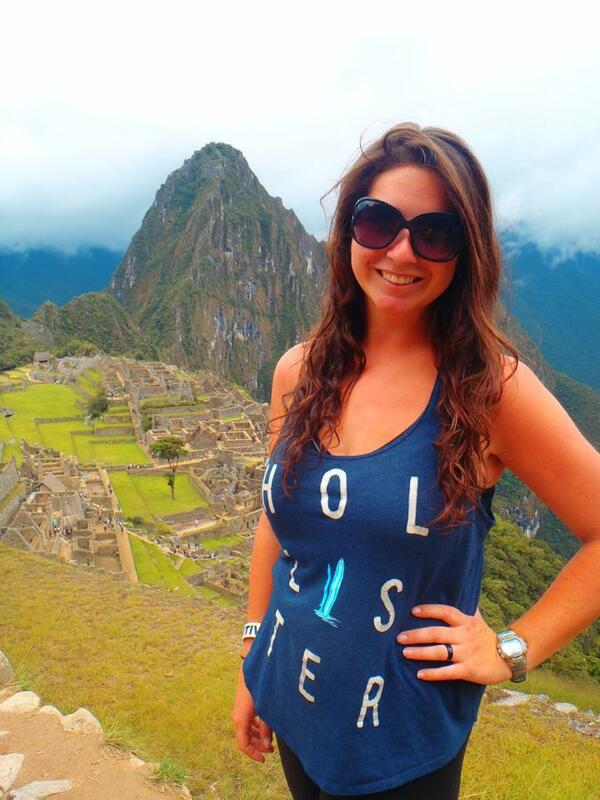 Take the pilgrimage along the Camino de Inca to the incredible Incan civilisation of Machu Picchu. The four day hike through mountains, rainforest, ancient ruins and staircases whilst battling the altitude is a once in a lifetime experience. One of the top items on my bucket list & it did not disappoint. Enough said – embrace your youth & release your inner adrenaline junkie whilst jumping out of a plane or off a bridge! There are countless places to do this around the world – skydiving over Dubai is certainly on my bucket list! 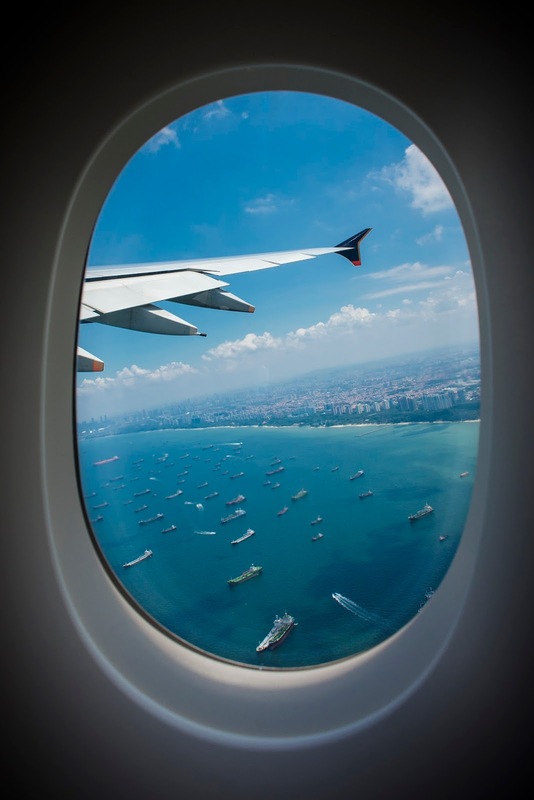 Take the plunge and move to another country for a year! Embrace the opportunity, get lost, make new friends, maybe find love and even learn a new language, all whilst seeing what your new home has to offer! Most countries have easy working visa arrangements for people aged 18-30, so what are you waiting for? The Greek Islands epitomise luxury, beautiful beaches, breathtaking sunsets and unforgettable scenery. Take your time to experience as many of the islands as you want, cruising from one to another. Drink, eat, soak in the sunshine and fall in love with Greece. Be bold, be brave and you’ll truly find yourself. You’ll be thrown into difficult situations and you’ll realise you can overcome more than you ever thought you were capable of. Solo travel can be lonely at times, but also so rewarding. It is a must do while you are young. Whether you want to hike Kilimanjaro, reach the summit of Everest or simply walk up your local mountain everyone should enjoy the sense of achievement of reaching the peak and the reward of an incredible view. What better way to spend a week then learning how to scuba dive and experiencing the amazing underwater world from an island paradise. Germany is the home to the worlds largest beer festival. Dress up in traditional German clothing, drink steins in the beer halls and get “Prost”-ing with your new friends. Grab your inner thrill seeker and cycle Bolivia’s infamous death road, a 40 mile journey that begins at 15,400 ft and descends down into the Amazonian rainforest in a single day! Known as one of the most dangerous roads in the world, are you brave enough to cycle down it? Most countries offer language schools that allow you to fully immerse yourself in the country and culture whilst learning the language. Learning Spanish in Central America is on our bucket list! Australia’s Great Barrier Reef is the world’s largest coral reef system with over 2,900 individual reefs and 900 islands, add it to the bucket list and go find Nemo. Spain’s tomato throwing festival is the worlds biggest food fight where over 100 tonnes of tomatoes are thrown in the street. Feel like getting dirty? Vegas is crazy… experience your own version of The Hangover, try your hand at Black Jack and stay in luxury in one of the famous casinos such as the Bellagio or Caesars Palace. New Zealand is a stunning country that is ridiculously easy to travel around! Hire a camper van and spend your days cruising around all its best places such as the adventure capital of the world Queenstown, Roturua, Milford Sound and climbing its incredible west coast glaciers, all in the comfort of your very own moving home! Canada, France, Switzerland, New Zealand, Japan – your options are endless! There’s nothing better than fresh powder, big slopes & warm pubs to relax in at the end of a big day on the slopes. The three or four day tour from Chile’s Atacama Desert to Bolivia’s Salar de Uyuni (or in reverse) is an incredible journey at altitude stopping at colourful lakes with herds of flamingos, geysers, thermal baths, a cactus island and staying in a hotel made entirely from salt, finishing up at the worlds largest salt flats – it’s a mind blowing journey and a highlight for anyone visiting South America. For those of us from the Southern Hemisphere, a white Christmas is the dream! On the other hand, if you are from the Northern Hemisphere, why not swap the snow for the beach one year? Cambodia’s Angkor Wat, the 7th Wonder of the World is the largest religious monument in the world and although you’ll have to fight the crowds, you do get a magical feeling as the first sun rays shines over the temple. 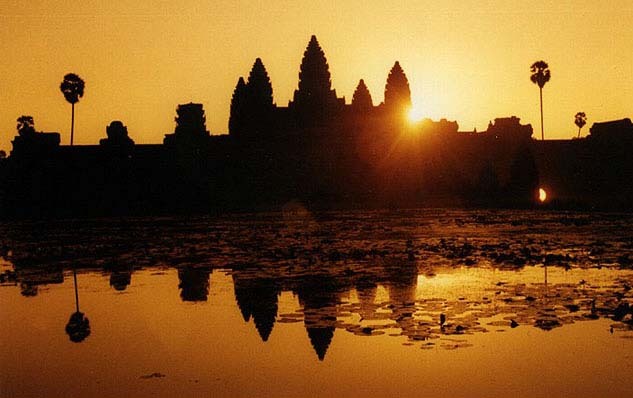 The beauty and preserved state of Angkor Wat is unrivalled. Spend your summer working at summer camp in the US, Canada or in a number of places in Europe. Summer camp is an incredible experience where you’ll work as a camp counselor and make friends for life, all whilst having a positive impact upon the kids you look after! You’ll spend your days teaching sports and activities, arts and crafts or lifeguarding by the waterfront! It’s hard work, but they don’t lie when they say it is a summer of a lifetime! Whether it is Glastonbury, Tomorrowland, Global Gathering or whatever takes your fancy, the European Festival scene is the biggest in the world and a must do for twenty-something travellers and party animals in Europe. Do something for someone else and volunteer in a developing country. There are countless organisations and projects you can work on ranging from teaching English to animal conservation and even building houses! Volunteering abroad (or even in your own country) gives you a true appreciation for just how lucky you are and allows you to help others. It doesn’t matter where you are in the world, some of my best memories with friends and family are from camping trips. A tent, the beach, the stars, a BBQ, drinks and good company is all you need for a good time away from it all! The awe-inspiring Iguazu Falls that border Brazil & Argentina are jaw-dropping and a must for the bucket-list. View them in their entirety from Brazil and then up close from Argentina. Take the time to take a boat ride under the falls – it is an incredible experience! 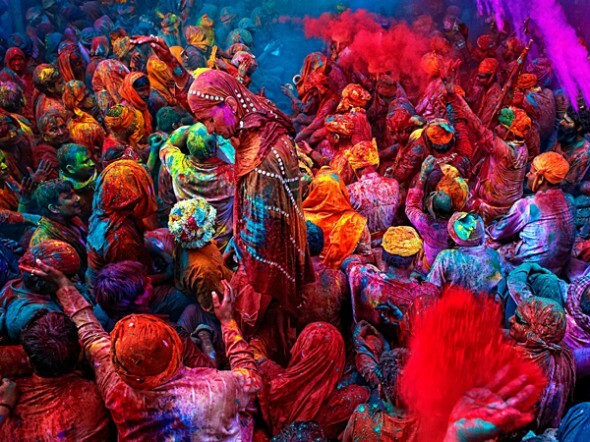 Get bright and colourful whilst celebrating the ancient, religious festival Holi, in India. Whilst I am in India I would also love to visit Sikkim, a northeastern state in India that is part of the incredible Himalayas. I would love to take one of the Sikkim Tour packages in order to fully experience this unforgettable part of the world. How many of these have you ticked off your bucket list?